Oklahoma City, Okla. – December 7, 2013 – By Christa Morris – The National Reining Horse Association (NRHA) Futurity Open finals closed out the 2013 NRHA Futurity & Adequan® North American Affiliate Championship (NAAC) Show at the Oklahoma State Fair Park in Oklahoma City, Okla. on Saturday, December 7. More than 60 riders were mounted on world-class reining horses all aiming for the increased $165,000 level 4 open championship purse and their share of NRHA Corporate Partner and Futurity Sponsor awards. In 2011, the NRHA Futurity purse saw large increases due to the NRHA Nomination Program and that effect carried on this year. The Cinch NRHA Non Pro Futurity paid nearly $600,000 and the NRHA Open Futurity paid nearly $1.5 million for one of the largest futurity purses in the show’s history. Approximately $100,000 went to nominators of Futurity finalists. Not Ruf At All and NRHA Professional Jason Vanlandingham (Whiteboro, Texas) marked the score to beat from draw number 2 in the second section of the finals. Their 225.5 held through nearly 30 more runs and they claimed the level 4 open championship. To date, he has earned more than $31,000 including championships at the Hollywoodstinseltown and High Roller Reining Classic Futurities. The win tonight added another $165,000 to that tally, including the $8,250 nominator incentive for Petra Zeitler Connor. 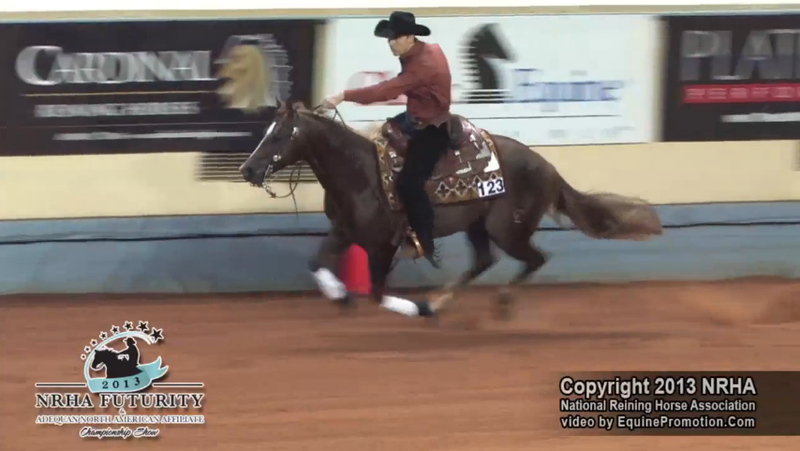 Not Ruf At All was consigned in the 2012 NRHA / Markel Insurance Futurity Sale. Vaughn Zimmerman owns the stallion that is by A Sparkling Vintage and out of All Ruffed Up (by Lil Ruf Peppy). Not Ruf At All’s earnings unofficially moved Zimmerman onto the NRHA Million Dollar Owner list. All open champions received a variety of awards from Corporate Partners and Event Sponsors: custom Montana Silversmiths trophy buckle, Bob’s Custom saddle, John Deere hay bag, Rios of Mercedes boots, Center Back Pads certificate, Classic Equine Contour Pedic Reiner, Platinum Performance CJ, Assure Guard and Sore No More from Arenus, Purina feed, SmartPak Gift card, $100 Pard’s Western Shop gift card, $50 Equine Oasis Gift card, Shorty’s Caboy Hattery certificate, $100 Kyle Tack gift card and an Icehole cooler. The Level 4 Open Champion also received a 4-horse slant gooseneck trailer with living quarters for the use of one year courteously of Twister Trailer. Level 1 through 3 champions received a $2,500 Twister Trailer certificate. The next finalists to enter the pen after Not Ruf At All was Tinseltown Fly Guy (Hollywoodstinseltotwn x Fly Flashy Jac) and NRHA Professional Shawn Flarida (Springfield, Ohio). They marked a 224 for owner Wagner & Vandorp to win the level 4 open reserve championship. The reserve championship paid $135,600 to the owner and $7,100 to the nominator, Melissa Vandorp. 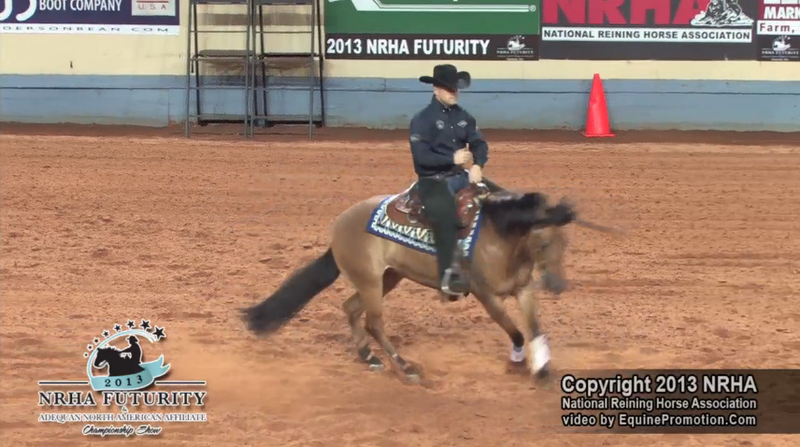 As of that ride, Flarida unofficially became NRHA’s first Five Million Dollar Rider. 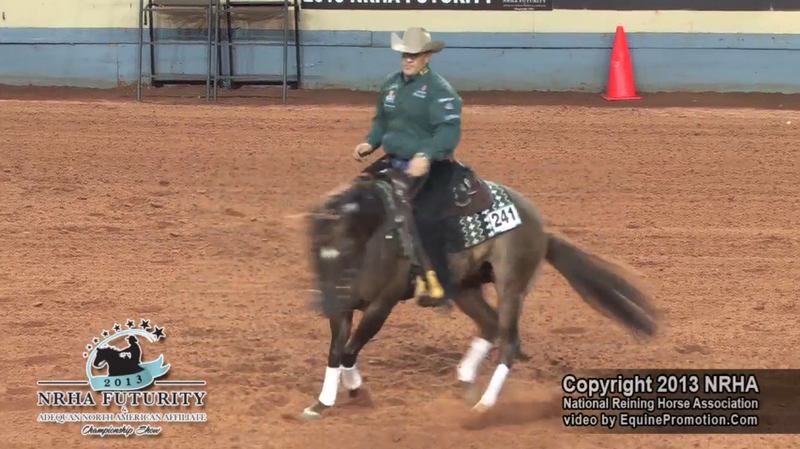 Casey and Kathy Hinton’s Black Hails Gold and NRHA Professional Jimmy Van Der Hoeven (Whitesboro, Texas) thrilled the crowd and scored a 223.5. Their score was good enough to win the level 3 open division and place third in the level 4 open division. In all, they earned $136,200 including the 5% nominator incentive for Rhodes River Ranch. Walla Dun A Whiz (Walla Walla Whiz x Dun It Like Torima) and NRHA Professional Patrice St-Onge won the level 2 open division and placed sixth in the level 3 open division for total earnings of $30,500. The duo won the level 2 and level 3 open divisions at the Darling 888 Ranch Developing Horse Futurity in September. Walla Dun A Whiz is owned by St-Onge Reining Horses. Alain Maheux nominated the stallion to the NRHA Nomination Program and received the 5% nominator incentive. After finishing in second place in the level 1 open division composite, Spark Of Starlight (Jacs Electric Spark x Starlight Angela) and Ryan Rushing (Whitesboro, Texas) turned in a score of 215.5. The score put them in first place in the level 1 open division and in fourth place in the level 2 open division to earn $17,500 total. Shelly MacLellan owns the stallion that was nominated by Cinder Lakes Ranch. NRHA Professional Carol Metcalf (Pilot Point, Texas) won the prime time open division riding Mister Smart (Mister Dual Pep x Cowgirls Are Smart, nominated by FOCUS). She owns the stallion with her husband Steve. NRHA also presented Sire & Dam Program awards earned in the open: Hollywoodstinseltown ($13,100), Gunner ($6,560) and Walla Walla Whiz ($6,560). Magnum Chic Dream earned the level 3 open division award. In addition to Zimmerman and Flarida’s accomplishments, the following million dollar milestones were achieved, unofficially: Mike McEntire (Million Dollar Rider), Brian Bell (Million Dollar Rider) and Arcese Quarter Horses USA (the first Two Million Dollar Owner). – High Seller – Hip 2046 – $300,000 – Mr Magnum Dun It – Magnum Chic Dream x Brennas Red Dunit (by Hollywood Dun It) – Consigned by Tallone Reining Horses – 2011 red dun colt – Purchased by Gier Ramleth. The NRHA would like to thank the following corporate partners for their support of the NRHA Futurity & Adequan North American Affiliate Championship Show: Adequan, Anderson Bean Boot Company, Arenus, Bob’s Custom Saddles, Boehringer Ingelheim, Cardinal Reining Horses, Center Back Pads, Classic Equine, Darling 888 Ranch, Downunder Horsemanship, Horse&Rider, John Deere, Kiser Arena Specialists, Kyle Tack, Markel Insurance Company, Merial, Miller International – Cinch / Cruel Girl, Montana Silversmiths, Oklahoma City Convention & Visitors Bureau, Pard’s Western Shop, Platinum Performance, Purina, Quarter Horse News, Rios of Mercedes, Silver Spurs Equine, SmartPak, Schmersal Reining Horses, Twister Trailer, World Development Group International and Xtra Quarter Horses.